In October, play the Culver’s Curd Rescue Sweepstakes at www.culvers.com/curdrescue and you could win free curds for a year plus a Curd Nerd prize pack. You could also win Curdis and Goldie plush toys plus free cheese curds. 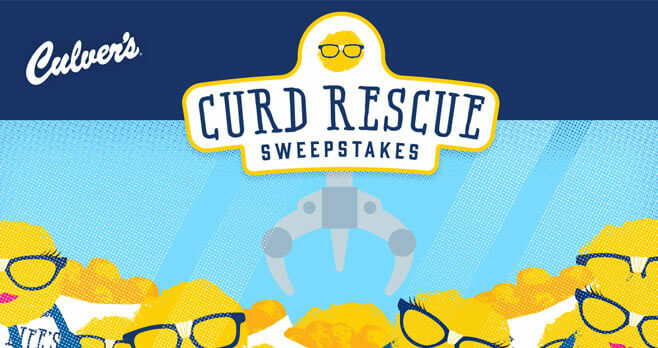 The Culver’s Curd Rescue Sweepstakes . The Sweepstakes begins on October 1, 2018 at 9:00:00 a.m. CST and ends on October 28, 2018 at 11:59:59 p.m. CST. Limit three (3) plays per day per person/email address. The grand prize consists of (1) Curd Nerd Pack consisting of one (1) T-shirt (size L), one (1) pair of Curd Nerd glasses, one (1) small Curdis plush toy, one (1) small Goldie plush toy, and Culver’s Wisconsin Cheese Curds for a year (via $500 in Culver’s Gift Cards. Gift Cards redeemable at Culver’s.. Visit www.culvers.com/curdrescue to enter and see Official Rules for details.